There&apos;s a lot missing since the Brits left town. Let&apos;s take a break from vying for cultural capital of the world and see what we can learn from one another. Further suggestions include the BBC, Boris Bikes (&apos;Citibike&apos; doesn&apos;t have the same ring to it), free museums, and selling hard liquor in supermarkets. You&apos;re welcome. 1. The Ultimate "Cheesy Dance Floor"
The lack of clubs playing exclusively pop hits and &apos;90s classics is a blight on America. Perhaps the higher drinking age has produced "sophisticated" and "edgy" New York venues like Le Bain and The Blind Barber. Many a British reveller has found paradise after searching Clapham High Street in South London for a mythical temple of sticky floors, value-label vodka, and R&B classics — Inferno&apos;s. No, not a classy venue for mooching around with a Dante-themed cocktail. The greatest Italian literature you&apos;ll find here is the screeched lyrics of Demi Lovato&apos;s "Heart Attack." It&apos;s almost like the perfect subway system was split between NY and London. We get the cleanliness and silence, you get the 24/7 operation and … that man in a superman cape who does magic tricks and then (doesn&apos;t ask for money) but tells you that Jesus is great. Intriguing. On the London Underground no one speaks, everyone reads, the carriages are clean, and every station shuts just after midnight. Okay, you win on that last one. Many a night I&apos;ve been happy to settle for superman-egg-from-behind-ear-Jesus-man rather than an elusive, $$$-sucking cab back to Astoria. One point to New York. You may have Blue Ivy, but of what is she going to be queen? Sure, Jay-Z is a millionaire but our queen is a billionaire (kind of). You heard. And she owns all of the swans. Plain Mr. & Mrs. Carter got nothing on Wills & Kate — ahem — the duke and duchess of Cambridge. I genuinely don&apos;t know if a) I was too dumb to find an Easter Egg in New York City or b) Michelle Obama&apos;s and Mayor Bloomberg&apos;s healthy lifestyle drives were finally kicking in, but I couldn&apos;t locate even one of the delicious chocolaty stomach-fillers anywhere within two blocks of my apartment. In Britain, we don&apos;t ruin gorging on food with exercise. 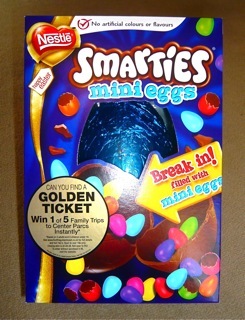 New York denied me such classics as the Nestle Smarties Egg, the Lindt Golden Bunny Egg, and the Cadbury&apos;s Creme Egg. New York politics can be sleazy, scandalous, superficial, and stagnant. You&apos;ve got that covered. But picture a large room full of elected officials forced to trade schoolboy insults, bantering back and forth with their best jokes and put-downs every Wednesday at midday on the dot. It&apos;s called Prime Minister&apos;s Questions, and it&apos;s the most efficient way to let off steam — ignore all pressing issues and have a good ol&apos; whack at the opposition. Yes, we know how to run a country.